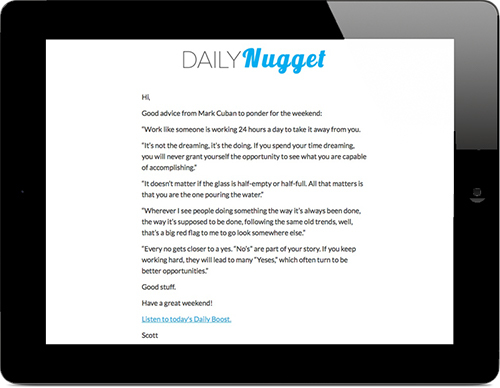 Start you day with the Daily Nugget email sent to your inbox every morning at 5:00 AM in your timezone. When you join us you'll also have access to all past Daily Nuggets. Talk about motivating! Here are our last 5 Daily Nuggets to get you moving. What if I told you that you could transform anything and everything about your life in an a short period. IF you put your mind to it. It’s called a PUSH – a massive collection of actions focused on a single goal. You shoehorn them into a defined period and get them done. During the PUSH, you overcome inertia and build immense and unstoppable momentum. The only thing that matters is the successful completion of your goal. You allow nothing to get in your way. Have you ever caught yourself doing or saying something you swore you would never do? It can be frustrating when you set the rules and don’t follow them. Sometimes you put your foot in your mouth. Sometimes you put the pizza in your mouth. In any case, your emotional habits are triggering your actions. Usually before you can do anything about it. 1) Catching yourself after the fact. Notice your mistake and find it sooner next time. 2) Catching yourself being triggered. You’re getting better. 3) Catching yourself before you act and stop it. GOAL! Don’t let Emotional Triggers throw you off track from your goals. Pay attention to your behaviors and make small adjustments until you get what you want. Want more Daily Nuggets? Start your 7-Day Trial for access to our library - plus we'll send a new one directly to your inbox every day.